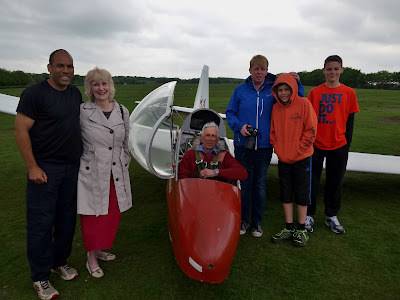 Simon Collier and I travelled up to the Cotswold Gliding Club, Aston Down on the Sunday afternoon, the weather forecast wasn’t looking great for the week but ever hopeful we were greeted by a smiling Don Puttock on arrival. Our aircraft for the week The K23 with the K21 behind. Monday saw us getting used to the K21 which we both really liked and we managed 8 flights each. Unfortunately Tuesday was low cloud (600 foot max) for much of the day so lots of cable break practice. Towards the end of the day the showers dried up and the cloud rose a little allowing me to go solo in the K21. 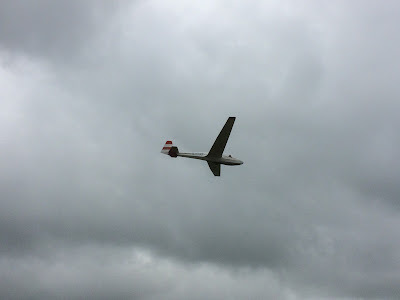 Wednesday weather was appalling, lots of heavy rain and I only managed 2 flights. Most of the day was spent huddled in the double decker bus, that acts as the launch point, drinking coffee and listening to lectures by Don on various gliding subjects but Simon managed to do the rest of his Bronze C flying tests and so a celebratory beer was had in the evening, well done Simon for getting his Bronze C.
Thursday the weather warmed up and in the first flight of the day I went up with Don and we latched onto a wave, a first for me. More solos in the K21 and Simon converted onto the K23 single seater. In the afternoon I also converted onto the K23, something I had never dreamed I would achieve. Friday saw Simon and I getting as many flights in the K23 that we could manage and lucky enough to find thermals and do some soaring. An incredible week, we got 32 launches each, Simon got his bronze C and I flew 16 solos and started working towards my Bronze C.
A huge thank you to Don, Ged, Martin and Gordon for helping us get to this stage, and also to all the members of Dartmoor gliding club who have encouraged and guided me since I joined. 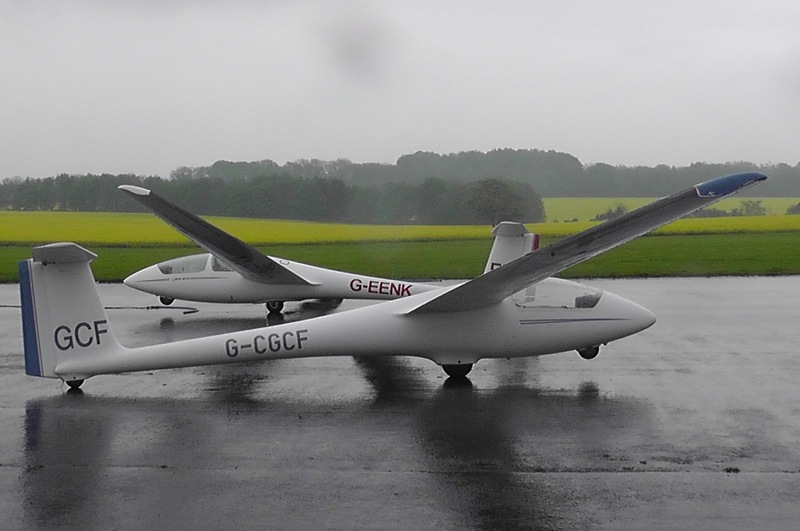 When the weather forecast predicts isolated, or scattered, showers, glider pilots don't hide under the covers wishing to avoid getting wet, they positively leap out of their beds knowing that this is Met Office code for 'the atmosphere is unstable – and therefore your glider will be propelled to great heights at little or no effort from you so long as it is not raining when you launch...' A thought echoed by a strong team of members today who, despite a short shower mid morning, we able to exploit some strong lift in a gentle north-westerly today. 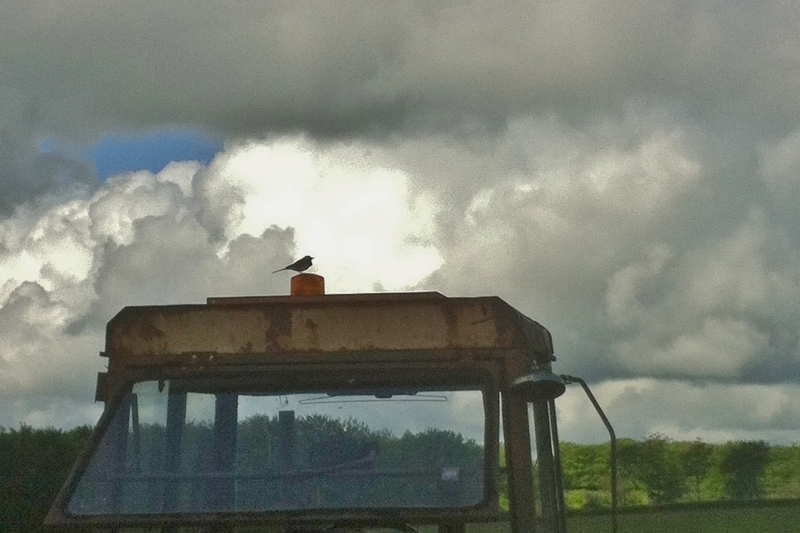 A pied wagtail atop the club’s tractor surveys an interesting sky. This wind direction favoured pushing into wind and hence, benefiting from a relatively early start (first lunchtime), Richard Roberts emphatically claimed Flight of the Day with a 110 kms cat's cradle around Launceston, Caradon Hill, Brentor, Roadford Reservoir and return in a little under 4 hrs. 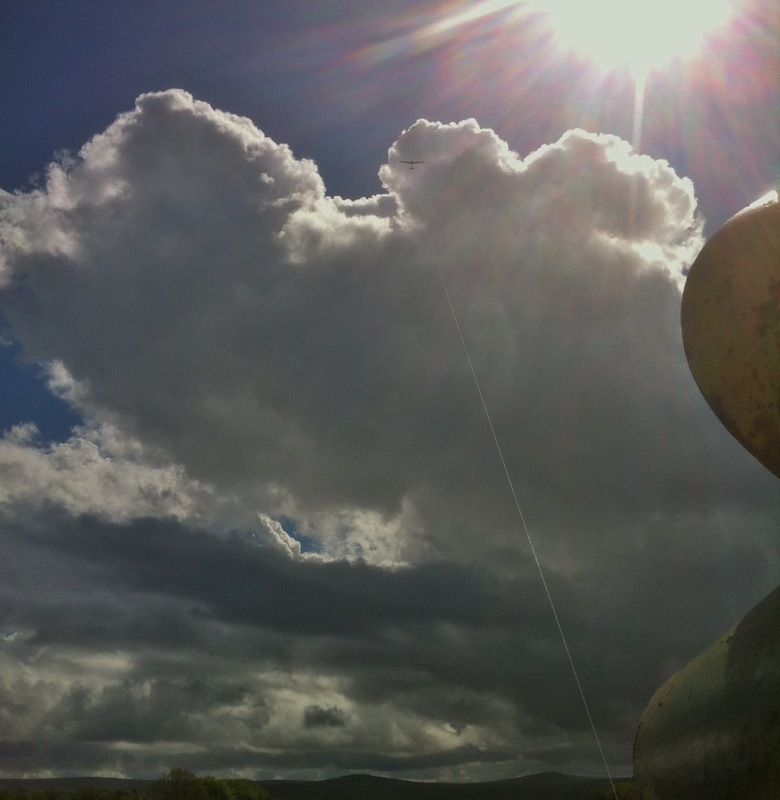 Adrian Irwin in the K-8 launches into a promising sky. Trainees ex-ATC instructor Jayne Marsh, partner Dave Jones, and returning member Charlie Taylor were also able to experience some pleasant soaring conditions in the morning. 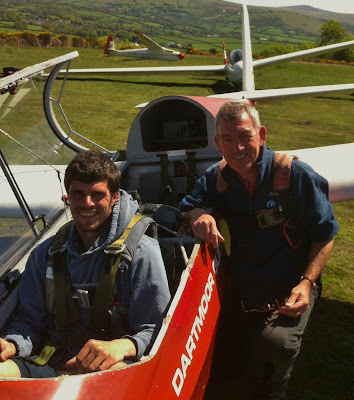 For more seasoned trainees, such as Ed Borlase, Dave Downton (flying with Gordon Dennis) and Pete Harvey, however, flying in the afternoon was a vastly different experience. Pete Harvey looking for lift in K-13 DMX. As has been reported by other clubs in 'another place' (ie. Facebook), today was a day of two halves for, although the sky continued to look inviting, the afternoon was characterised by some fearsome sink which prevented all but the very bold from venturing far enough to find the lift which was being condensed between cascades of sink. As Gordon Dennis put it: “Have you seen clouds looking as distressed as that?” Or as Allan Holland said, after an hour's fight with the controls of the K-8, “One minute the thermals were narrow but shooting you up at 6-8 kts, the next you're in a large pool which delivered no more than ½-1 up; and the approach (ie. wind gradient) was the worst I've ever experienced..!” With which Ed Borlase and Gordon Dennis, after a 36 minute flight in the 'washing machine' knowingly agreed. after an hour in the ‘washing machine’. 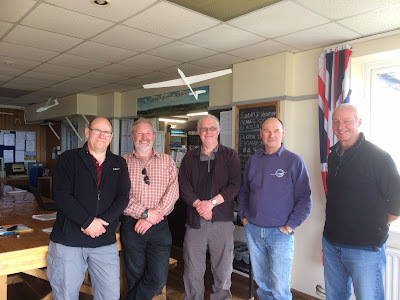 With thanks to Heather Horsewill for driving retrieve for most of the day and winch drivers Roger Appleboom, Allan Holland and Barry Green, after 31 launches we were grateful to the sky, and weather forecast, for delivering some of the most interesting flying of the year so far. 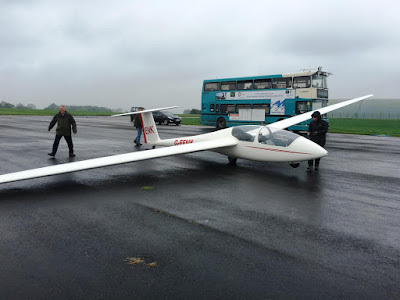 After yesterday's flying with it's lowering cloudbase, it was no surprise that the cloudbase continued lowering until it met the airfield today. Thick fog with endless drizzle and rain. 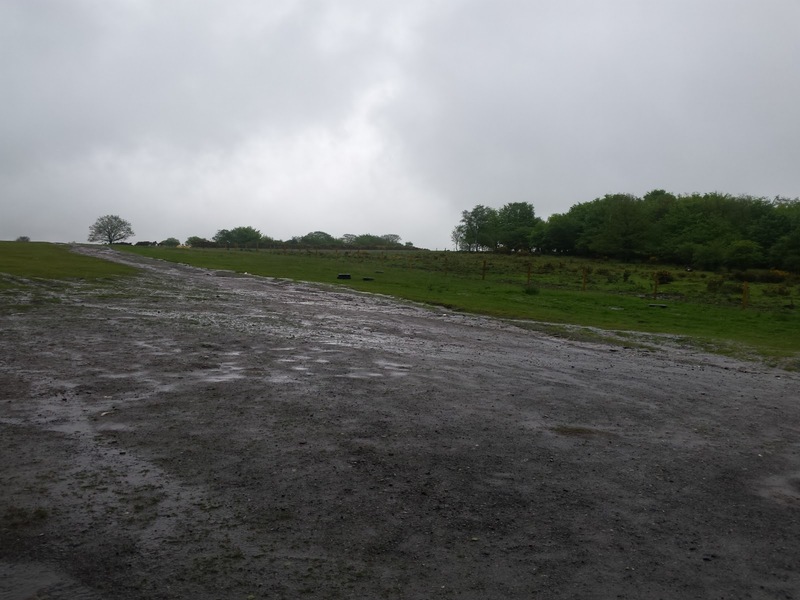 A typical Dartmoor non flying day. 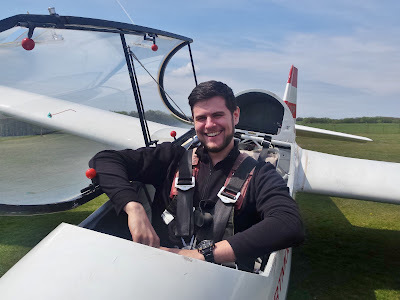 The weather was particularly disappointing as today saw the last visit of Stefi, our Romanian university student who has been flying with us for the last 3 years. 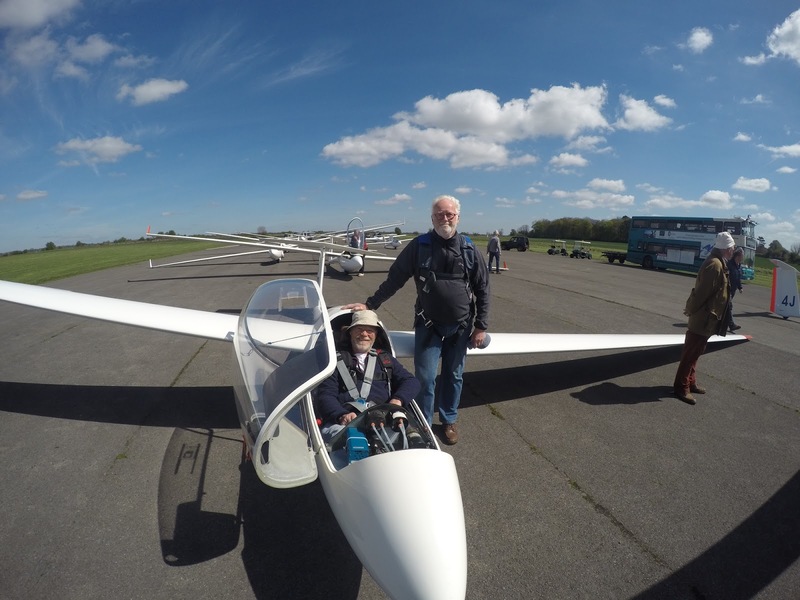 Sadly, ( for us), Stefi is now moving on having completed her studies at Plymouth University and will be studying for her Masters in Nottingham next September after a summer of flying her own glider at home. Stefi will be missed. 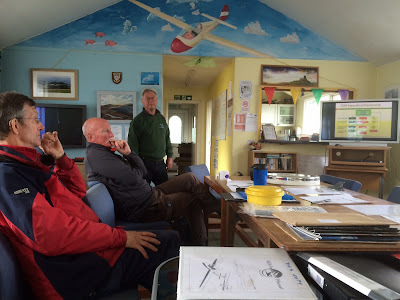 There was no let up in the weather, but looking at the forecast, tomorrow might well be flyable. 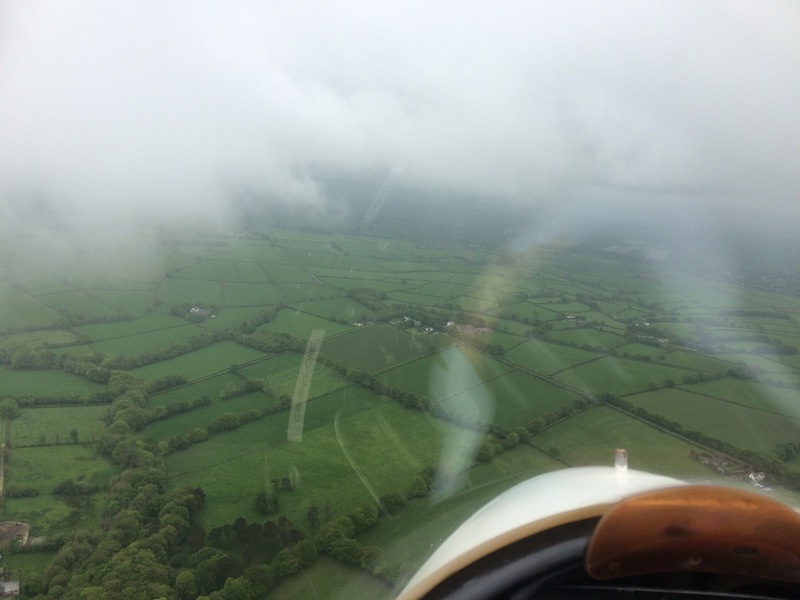 The day started with first flight of the day by Dave Dowton to the backdrop of grey clouds with a cloud base that never increased above 1000 feet. 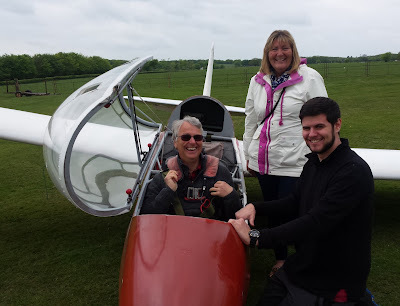 There was a short soaring flight for Heather Horsewell with myself and a rear seat practice flight for Steve Raine . New member David Wescott continued training with Gordon . Heading south, looking east. The runway is on the left edge. After a total of 9 launches the cloud base was down to around 600 feet so we returned to the clubhouse for a lecture of Threat and error management. Thanks once again to Barry for the winching. “You’re not a virgin anymore, mate!” beamed a delighted Richard Roberts when I finally arrived back at the airfield on Saturday evening with Barry and the K6. And, like that other lost virginity many moons ago, it all felt painless, natural, and rather pleasant; my only concern was missing the sumptuous BBQ put on by the lads and lasses at the Wyvern Gliding Club, but I need not have worried - they had hardly started the feast. The morning hadn’t exactly brought with it that ‘air of promise’ that the start to an adventure should. Arriving at the airfield at 8a.m., with Richard the only soul stirring at that hour, checking his K6 in a thoroughly business-like way, we helped each other rig - ready for tea and egg and bacon butties prior to the 10 o’clock task briefing. It was then that I discovered the gaps in my preparation that a late finish the evening before and an early start inevitably brings. The Oudie I had packed, but not it’s support bracket, so there was nowhere in the glider to display it, but as it was not plumbed in to a separate power supply the battery wouldn’t last long anyway. Map and compass it is then, although the 1:500,000 chart I had with me seemed to show a pitiful lack of detail. Water would have to be stowed in the ‘map pocket’ on the side, but so would the hand-held radio, phone, chart, pen, camera - and anything else I might wish to take……. ummm……storage space will have to be a consideration in the future if I actually wanted to fit in the glider AND use the rudder pedals. I wandered into the briefing without a chart, notepad, pen map marker, so couldn’t even note down telephone numbers, radio frequencies or turn points; the latter I could only find on an AA road atlas. I had once taken a motorcycle into the Sahara desert with similar ‘meticulous planning’! 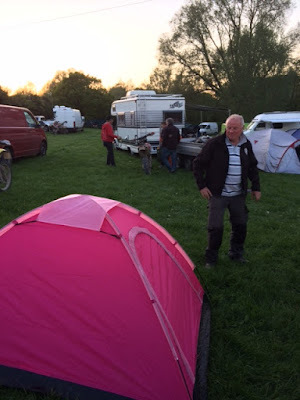 The task itself was 130kms; Upavon, Melksham, Wantage, Upavon. I had expected about 50kms, a jolly around the airfield, not a Grand Tour of Wessex. This was meant to be the novice task. Luckily I could not have asked for a better crew; Richard lent me his 1:250,000 chart and marked the route for me. Invaluable advice came from all quarters. 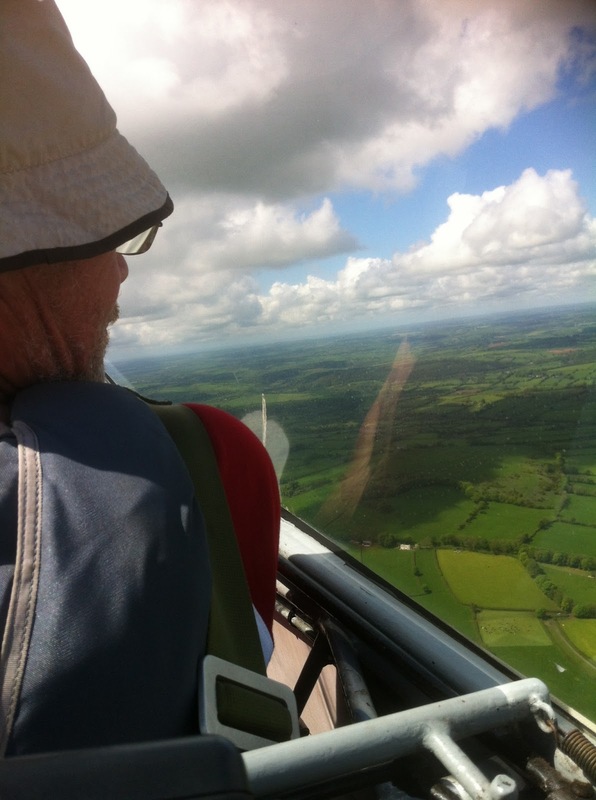 Richard:- go north for a bit to avoid airspace, then west; two large towns will be obvious, Devizes then Melksham. Turn over Melksham and head north-east, keeping south of the big blot on the landscape called Swindon. Using head marks all the time, using compass headings for back-up, confirming ground features with the chart - good basic advice. From Roger:- mark the compass headings on the chart to take the load off when flying and navigating. From Barry:- field selection early, but having got an escape route, never give up. Thanks guys! For all the lack of preparation, and apprehension at the briefing, once in the glider there were no nerves, just the thrill and exhilaration at the prospect of a flight without the need to keep an eye on the airfield. The launch gave me a respectable 1200ft. 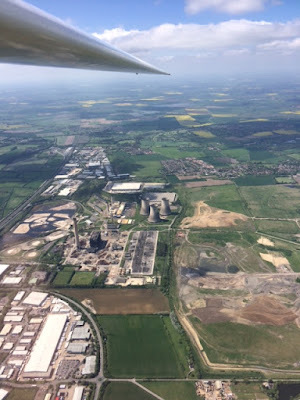 I climbed a few hundred more, the clouds to the north looked little different from those above the airfield so I decided to start the task straight away. I flew over the hangars towards Marlborough to clear the Downs, and then turned west , knowing that the only way I was going to land back at the field was if the task was completed. My advice to myself was ‘DON’T LOOK BACK’, but at that moment it was not needed; I had neither the wish nor interest in doing so. I’ve spent most of my life with an ant’s eye view of the world; distances seem huge because you can see no further than the nearest bush, tree or building, around which I must scamper ant-like to get anywhere. In the last few years I’ve been privileged to view the countryside as a bird does; a different perspective that is still a delightful novelty. Looking east from Pewsey, where I found another 500ft, Devizes was a blot on the ground lying just south of my intended heading, with Melksham another clearly visible landmark further on and slightly north. With a top-up in a thermal between the two towns I rounded the first turn point at only 1200ft, and heading back towards Wantage. Into wind, I was always fighting for height, hugging the north side of the Downs, where there always seemed a bit of lift. 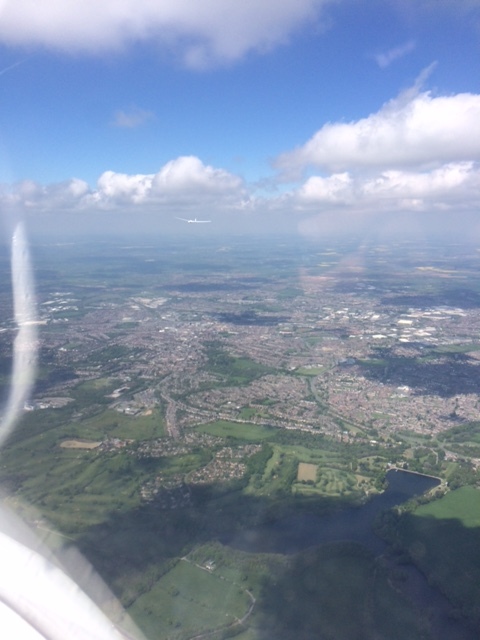 The intended course was 060, but my more southerly route crossed the M4 near Membury services - way too far south of Wantage - and again with 1000ft. I picked a field on the southerly edge of Lambourn, over which I circled like a dog chasing its own tail, until eventually 1000ft turned to 1200ft, turned into 1500, and then at 2500 with a couple of Red Kites for company I knew I was still in the game and headed north for Wantage. If the last turn point could be reached with any height then it was a down-wind leg and a chance of completing; if not, then the K6 would be parked as close to the turn point as possible. The Ridgeway path runs over Lambourn Down - pretty from the air, but the northern edge turned min. sink into max. sink, and at 700ft, with a field already spotted and looking increasingly attractive, I resigned myself to the inevitable, and without any doubt or regret, went into a circuit for a final check and landed into wind, slightly uphill, and along the furrows rather than across; all too smooth, all too easy; how I love that K6! resident I could find, and then a wait for my retrieve - ‘superhero of the day’ Barry Green. 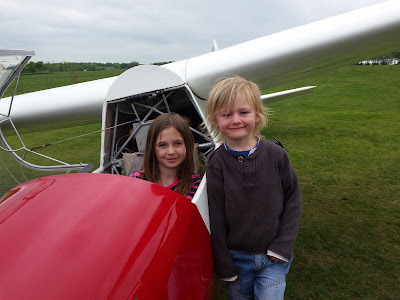 Sitting on a warm chalk Down by the side of the glider, watching a pair of Red Kites swooping low over us with the Cumulus visible beyond, I reflected that no-one had yet devised a finer way to spend a Saturday. While I was goofing around completing no more than 3/4 of my task, Richard Roberts and Roger Green completed their own tasks with aplomb, 270k and 200k respectively, Richard in his K6CR - the only wooden ship outside the novice class - in a time matching the more modern fibreglass exotica. Yet both were generous in their praise of my own much more modest efforts; Airmanship AND Esprit de Corps…….something we should all aspire to. Where do I start...? Stood alone on an unfamiliar RAF UPAVON airfield with tarmac tracks and lush, green, level grass, all this felt alien to a DGS pilot like myself. Then, at 8:30am, as Roger Appleboom drove around the corner of the massive hangar, K-6 in tow, normality began to be restored. Then Barry and Roger Green arrived - this was getting more like it. We all rigged, then headed for the porta cabin clubhouse (briefing room, storage and bar all in one). Briefing was short and sweet. The ICL is well run and always full of willing helpersfor anyone who is unsure. 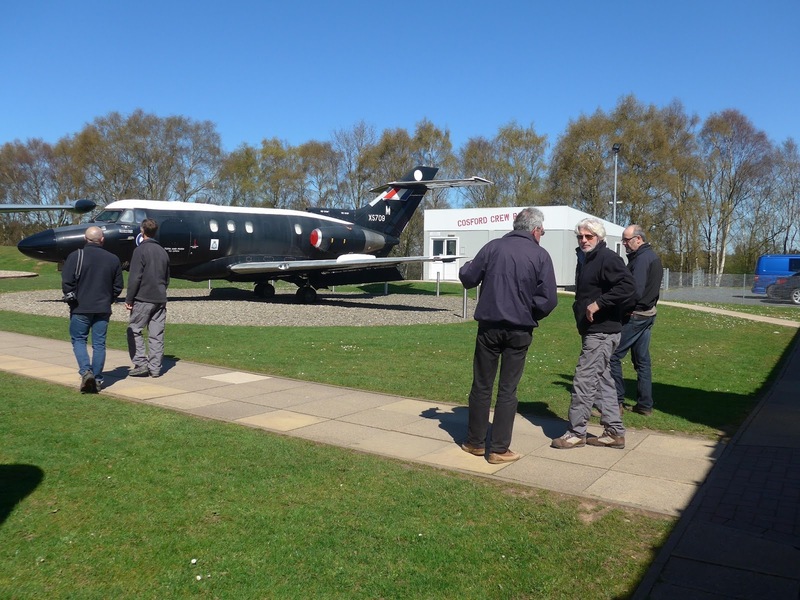 The task was explained, with local weather forecast and all the usual info: when thermals start, and more importantly when they are expected to stop!! We all marked our turn points on our trusty maps with chinagraph pens. The rest of the pilots started pressing buttons on the technical wizardry they had brought in, then walked out to the shiny plastic gliders that had appeared from nowhere. Before we had time to ponder what we had let ourselves in for, I found myself doing pre-flight checks and thinking "Best get going it’s 12 noon already!" After setting off we all thought the same, we’ll give it ago but we don't expect to get around the task....but here we are so best crack on. Cut to the K-6 with Roger A and the story was a little different. Learning to fly at Dartmoor has its advantages I feel. We are taught to thermal in small broken thermals and are accustomed to low cloud bases, so we often cover ground at less than 2000ft because we have to... Roger A took this to the extreme and left for task, crossing the start line at 1600-1800ft: "Making progress into wind was becoming hard work", he said. I wasn't surprised, when cloud base was 4000ft and rising. Even so, Roger made great progress after this by rounding the first TP and getting into the swing until his downfall just short of the 2nd TP. Roger’s first field landing was into wind, uphill on grass in a field you could fit 5 x Brentor airfieldsinto! Great choice, Roger. He was kindly picked up by the ever ready Barry Green with no major problems to report on the seamless retrieve. Nothing left to do but hand in the loggers so the Wizards could let us know how we did, and if we rounded all the turn points. Roger and Barry headed off to the B&B 20 mins away. 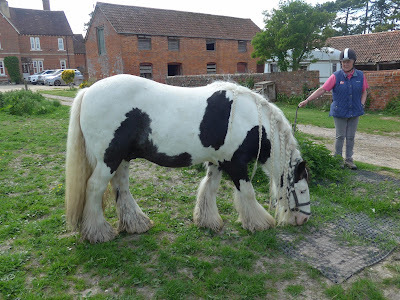 After all the excitement and hard work yesterday we were feeling like it should be a slightly shorter task as the weather was due to cut off at 3:30pm - but the locals had other ideas. Roger A - 130km down to Frome before weather and sea air cut things off then another 2TPs. Roger G - 165km Trowbridge (same reasons as above) then another 3TPs. Richard - 290km Frome to Oxford and another 2TPs. 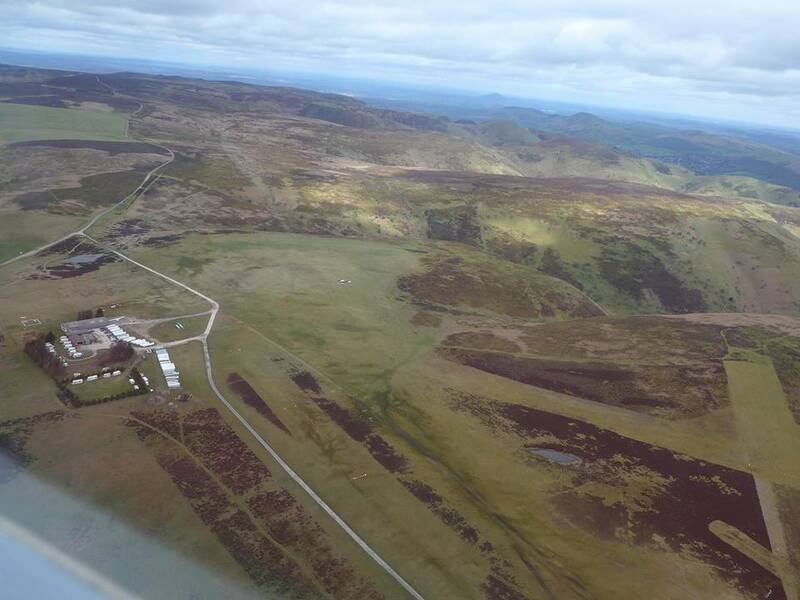 The task has so many turn points so as to keep us reasonably close to the airfield should we land out! In the event we never spoke about it before we all took off but we all had similar ideas: give it a go, but if it wasn't great cut the task short and turn for home. 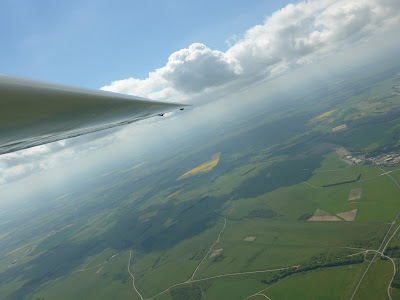 As I got near my second turn point the sea air was making things weaker, so short of TP I turned back for Upavon and, as is normal, during this glide hit an 8knot climb up to 4,800ft cloud base. You have got to love flying in the middle of the country for this very reason. 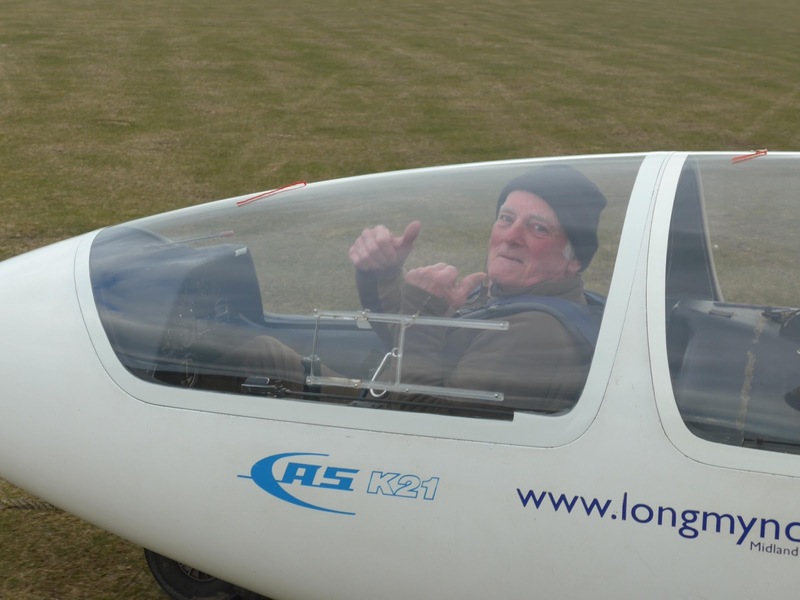 Roger A had a nice flight after abandoning the task and just enjoying the countryside, a fact we could see written large on his face when he landed. Roger G/Barry G and myself had de-rigged and paid our dues ,just as the K-6 landed by us with a very happy Roger A. After a debrief from Roger G about the flight for him. A shame as he only got off the ground for a nano second before a big bump prematurely put his undercarriage up while still on the ground run of the launch. 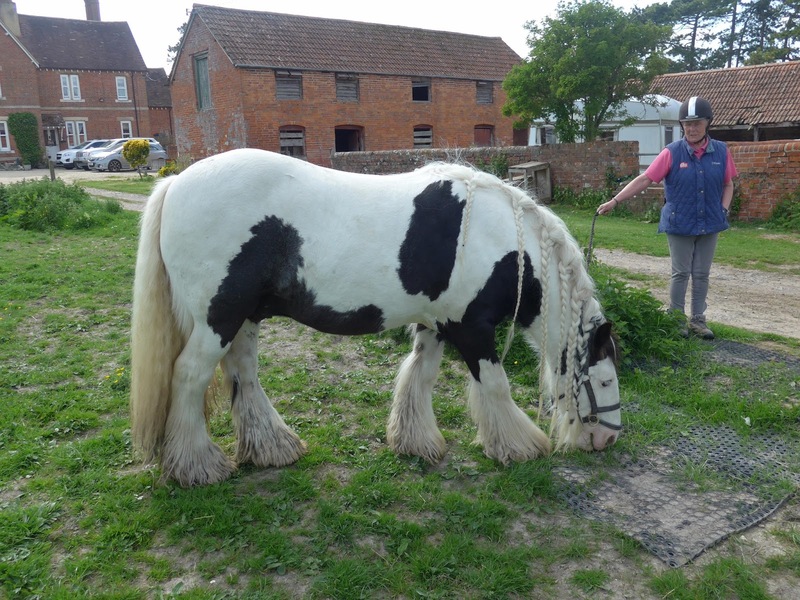 Good news is no damage but the length of time taken to sort it and check it was safe put paid to the task of the day. 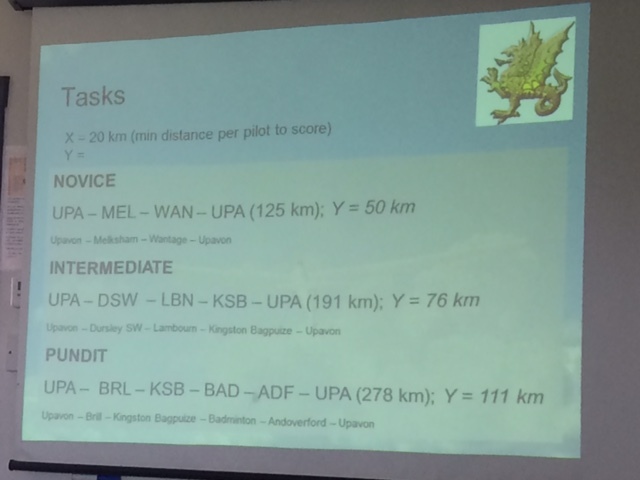 Just some headlines for you to think about ... .
Dartmoor ICL pilots managed a Total of...571 kms flown on tasks.....total 14 hours flying time. All in two days on a weekend. Only financial costs were launches, BBQ, camping (about £80 plus fuel - seems good value to me). Many Thanks to all, good weekend, good company. Especially Barry for all your help pulling pushing , rigging and driving. 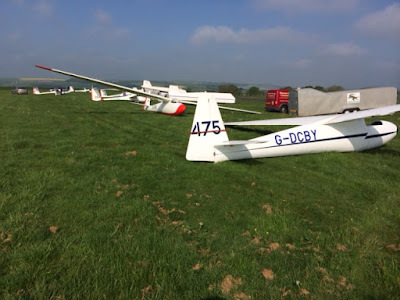 Next ICL: Two weeks time at Keevil (another massive, organised, lovely airfield) anyone who wants to come and help out and see what it's about they are welcome. 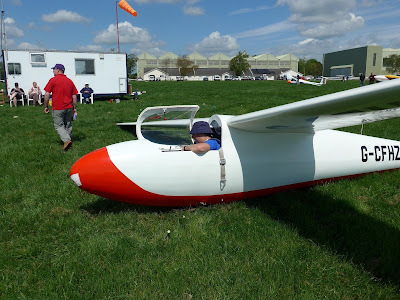 This is really for anyone with bronze and cross country diploma if you want to fly BUT....for anyone who likes the buzz of cross-country and a team of mixed abilities and characters, the ICL is a great experience. If you think I'm biased (I am) just ask Roger A or Barry/Roger G. We all got a great deal from this weekend. With a gentle north-westerly and RASP predicting 3.5 by mid-afternoon there was everything to play for today... So it was not surprising that there was a team of ‘keenies’ early on site to get the club gliders out, all with their own agendas for progressing their flying. 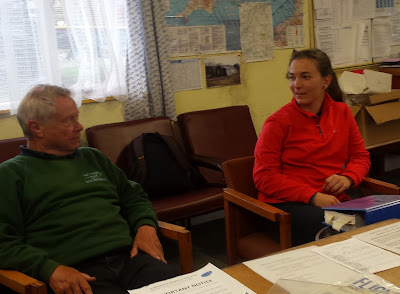 One Day Course student Alison Jackson also appeared early in readiness to fly with instructor Gordon Dennis, whilst Local Firing Range Warden and Mary Tavy resident Ben Neale (see photo) turned up punctually at 1100 for his introductory flights. Introductory Flight visitor Ben Neale. Steve Fletcher reacquainted himself with Brentor after recently going solo at Aston Down (congratulations!) 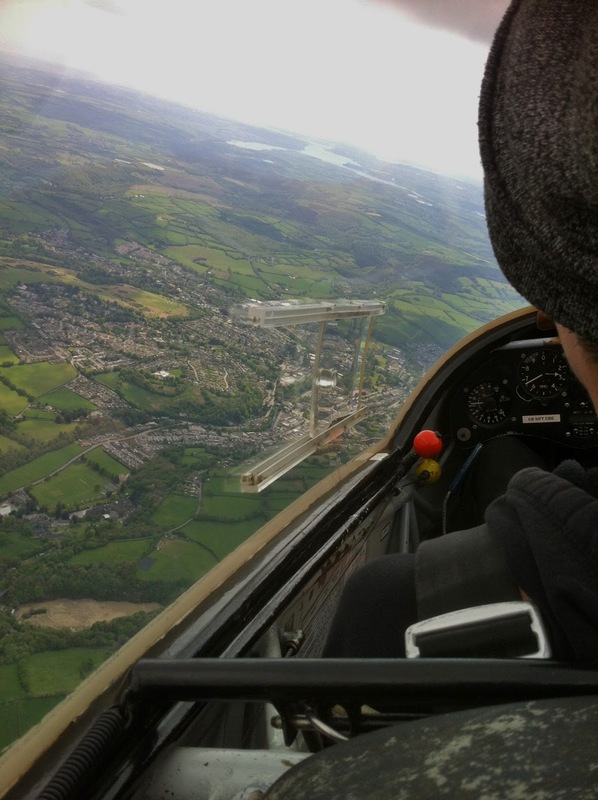 Paula Howarth consolidated her conversion to the K-8 and, in the early afternoon, Kit Smith struck a stonking thermal that took him straight up to 3,000ft over Tavistock (see photos en-route). 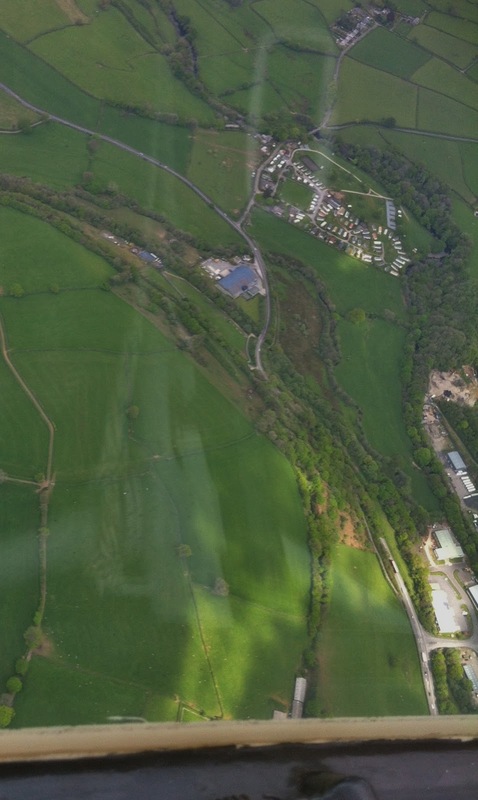 Kit Smith just to the north-east of Tavistock at 2,700 ft. Sadly, problems with the winch prevented us from completing the full day’s flying programme, and hence Steve Fletcher almost (but not quite) converted onto the K-8, Alison has some launches in credit for her One Day Course and thanks must go to others, such as Dave Downton, Jorg Beasley, Josef Nobbs and Adam Fox-Edwards who didn’t manage to fly. Pitt’s Cleave Quarry business park. 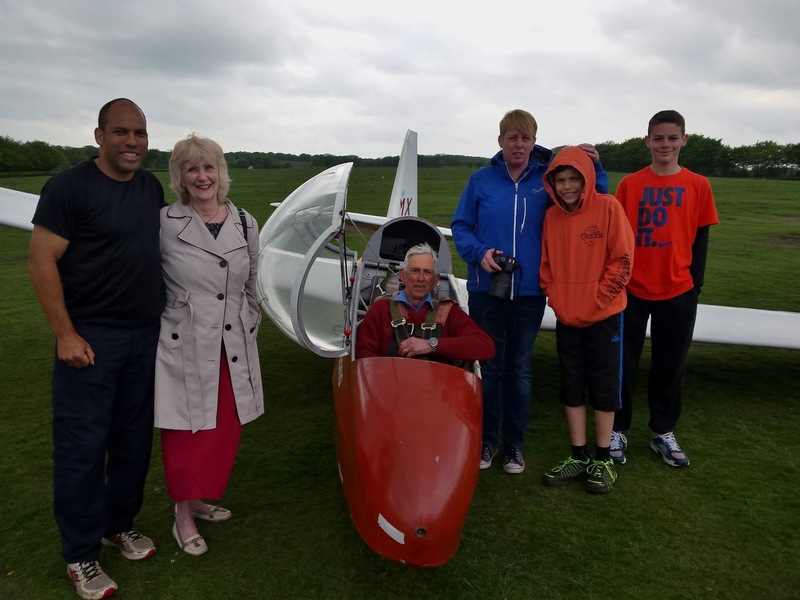 It was good to see returning member Tony Deane, however who, having regained his Friends and Family privileges thanks to a couple of flight with Gordon, introduced wife Anne to flying at Brentor and former Air Cadet Callum Doyle to our Fixed Price to Solo scheme – we look forward to seeing much more of you, Callum. The day started with a grey overcast sky with light airs from the east. Gradually the cloud moved and created a few sunny spells and the wind direction wandered until it was light and southerly by the end of the day. 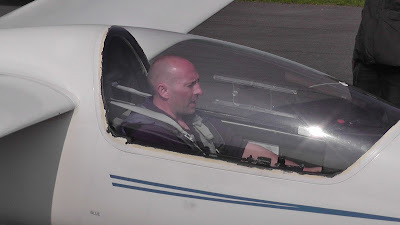 First up today was One Day Course candidiate Roy Bain who had his first 3 flights with today's instructor, Gordon Dennis, before finishing his course with me. Meanwhile I was flying with visitor Chris Pike. At this stage of the day both K13s managed soaring flights using an area of lift between Mary Tavy and Gibbett Hill. The sun was relatively weak but must have been strong enough to set of a few smooth thermals from the south facing slope. Visitor Chris Pike and wife with Matt Wiles helping. Club training continues with Mike Bennett having what he described as a "frustrating day". Learning to fly is a bit like that sometimes. Three steps forward, two back etc. Matt Wiles continues his path towards re-soloing after recently rejoining the club after several years of absence. The later part of the day was a little disappointing. Try as they might club members and instructors alike just could not find those elusive thermals. Friday 13th May weather forecast puzzled me, but Ged and Gordon got it right – ENE for half the day then N then NW. So had to change ends half way through the day. Not many pupils today, so Ged and Dave Bourchier kindly helped at the Launch Point. Jeff Cragg was given two launches to start with, the first abandoned after a short hop. Then two brief flights, one with brief soaring. 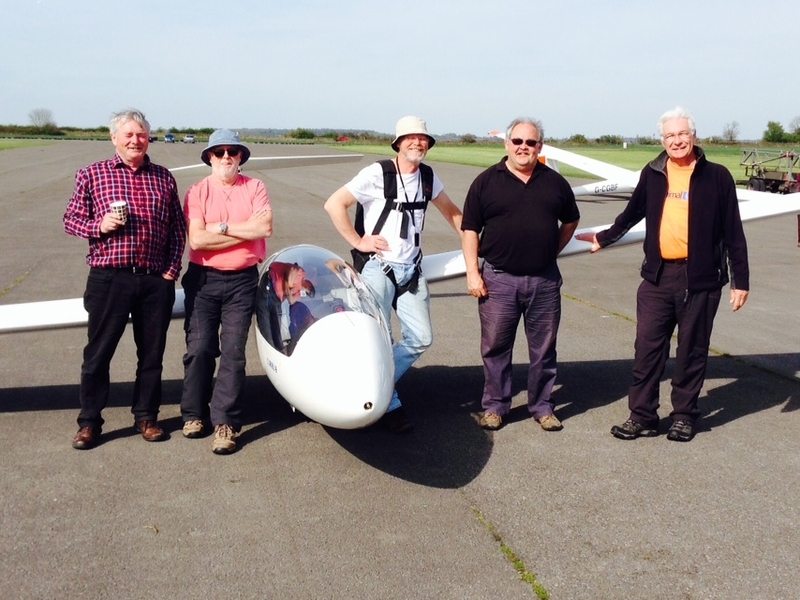 Steve Raine managed 10 minutes with soaring just east of Brentor Church, then a briefer flight. 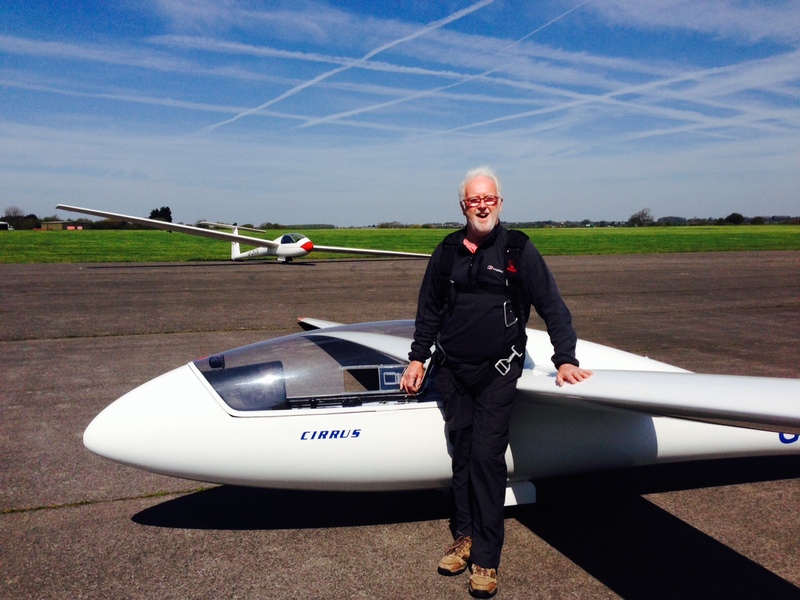 Jorg Beasley had four brief but action packed flights early afternoon. Ged then commented: it looks as if it's getting thermic! I flew with Gordon for the first time and enjoyed the convergence of a northwards moving sea breeze front hitting the Southwards main air mass for 48 minutes. An inversion at 2,000ft we couldn't penetrate, with side slipping practice high up, then demonstration for the landing, so was pleased to buy the beers! 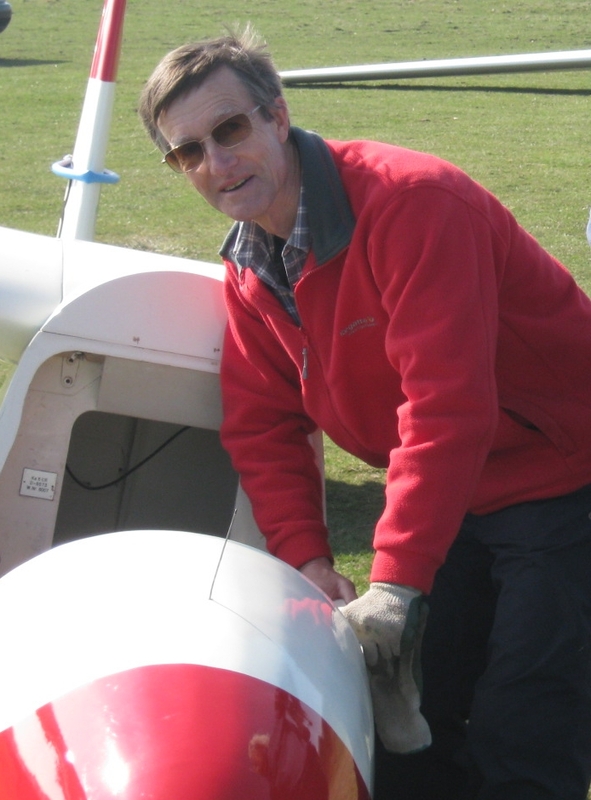 In the meantime Colin was in the workshop working on the trailing edge of a wing all day. Well done Colin. 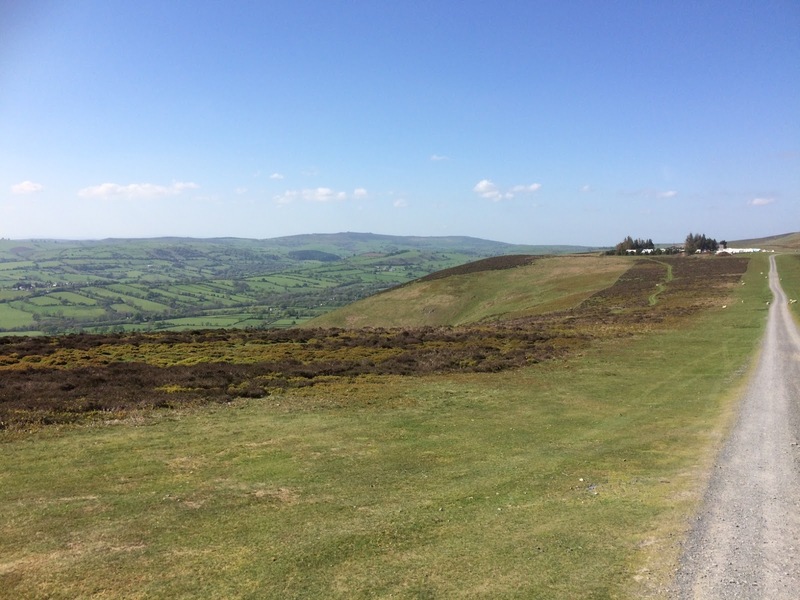 Module "C" at the Long Mynd. The Saturday training started with the club's 9.30 am briefing for all pilots and then our training brief started with Simon Adlard assisted by Steve Males. The twin Astir and motor Falke are also at the ready for the training course. After two hours of lectures it was into the air in the Astir and the motor Falke . The training involved how to ' pre flight ' briefing in the clubhouse and then demonstrate slow flight exercise and turning exercise including the patter. Coaching a ' type ' conversion was the next exercise using the twin Astir and then Saturdays training finished with taking the Bronze C exam in the evening. Sunday morning started with the good news that we had all passed the Bronze exam. However ,a debrief on the Saturday exercises brought our attention to some areas that had room for improvement in and we went to work on those areas with more flying in the Motor Falke. 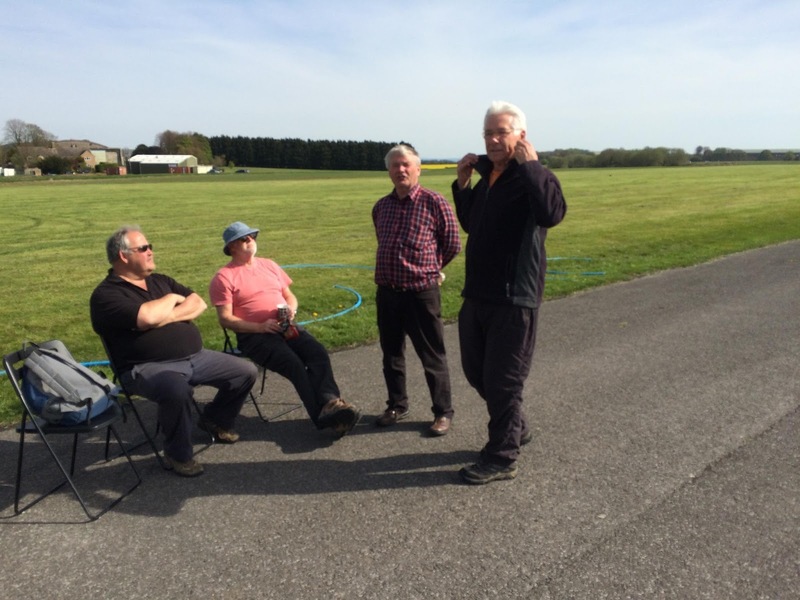 We would like to extend our thanks to both Simon and Steve for ensuring we completed the course successfully and to the Midland gliding club for their very warm welcome and hospitality this was greatly appreciated. by Simon Adlard and Steve Males as , ' successfully completed '. 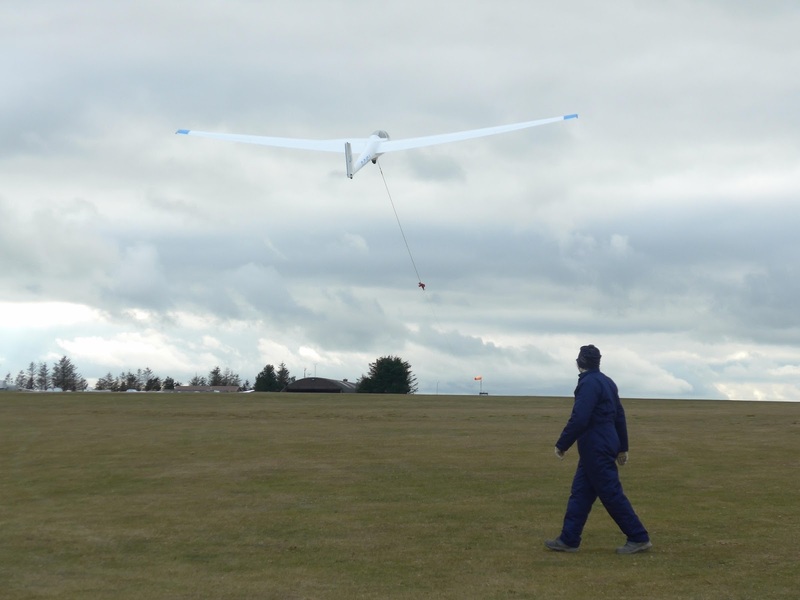 So we raced up to the launchpoint with the expectation of a full day’s flying and, with the first launch, leapt to just short of 1,700ft QFE, where the air was smooth as silk. All too soon, however, (as the wing tips flexed on the ground and wing tip holders struggled to keep wings steady) it became clear both the wind speed and gusts were increasing and, with our weather station on the launchpoint recording 34.4kts, we had to put safety first and return the gliders to the lee and relative calm of the hardstanding. The K-6 on its way to 1,600ft on the launch. Once dust devils started whipping down the track and we had to put tyres on the tailplanes where the gliders were parked out of the wind, it was not difficult to decide that we would have to call it a day, put them away and retire to the relative safety of the simulator, or get on with other admin tasks. It feels very odd returning gliders to the hangar with the sun belting out heat but one thing was certain: there was no wave within reach – our four launches, each of around 10 mins duration and all to 1,600ft plus, had proved that. a ‘sanding session’ on his glider. Thanks go to everyone who turned up today, and especially to Roger Appleboom who, in addition to regaling us with tales of going to school with Ian Botham, has devised some rope loops with karabiners that will enable us to tie the cable to a tyre at the end of the day without having to abuse (and risk kinking) the cable itself. The loops are hanging on the coathooks in the launchpoint. Today was mostly sunny with the wind a little south of east. Easterly? That means wave doesn't it? We were a small group today but were determined to fly. The first flight went well. Good launch height, an area of smooth reduced sink ( this is the wave, just not strong yet ) with a difficult but manageable approach. 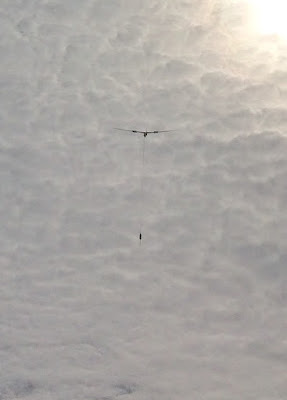 Second launch, the wind had strengthened, smooth wave was now absent and there were areas of heavy rotor turbulance. The approach was even more character forming. G-DDMX waiting to fly before conditions became too boisterous. Launch three, which lasted 20 minutes, found some wave lift, very heavy turbulance and an approach that was best described as character forming. Meanwhile on the ground, the wind strength had risen alarmingly with very heavy gusts. We were having problems controlling the gliders on the ground, so it was an easy, but regrettable, decision to stop flying and return the gliders to the hangar. 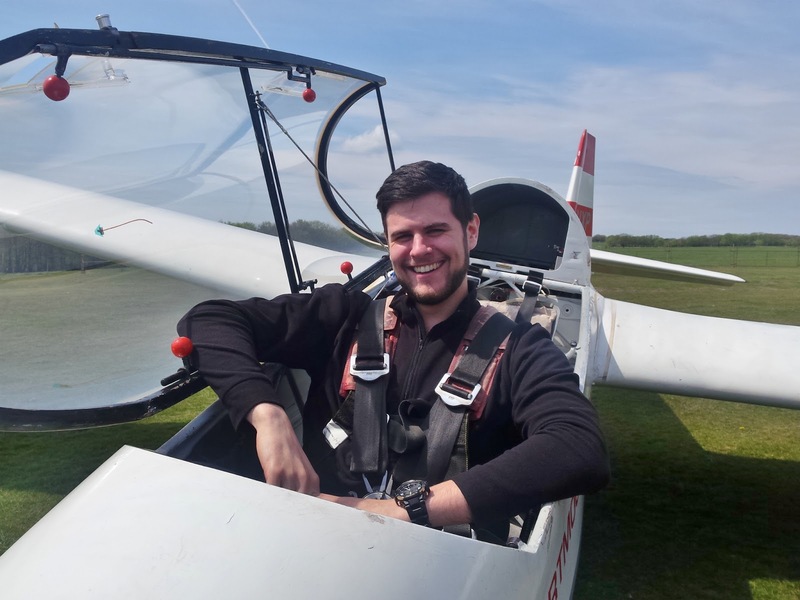 The biggest news today was the return to the club of Matthew Wiles who has been absent for several years while completing his degree, but with 19 days to go at university he could resist gliding no longer. After one flight, ( flight 3 with Ged ), he was once again sold and minutes later he was signing his membership form. Welcome back Matthew. 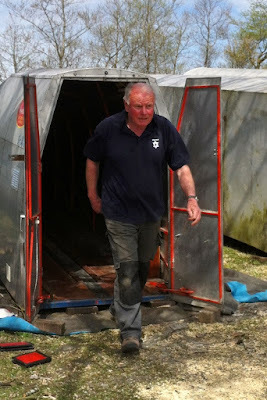 Elsewhere,Colin started work on the Zugvogel annual inspection. We arrived back from the launch point just in time to help with this and to disassemble the aircraft ready for further work. 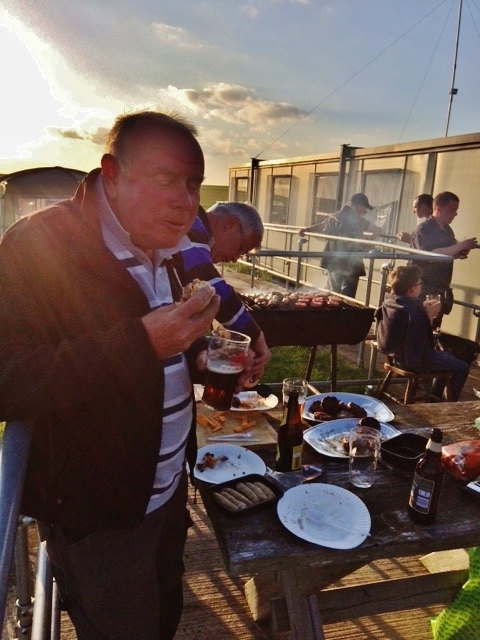 On early Sunday evening three Club members, Adrian Irwin, Chris Owen and myself, Pete Harvey, met at Aston Down. The forecast for the week ahead looked good and once I had overcome the problem of being locked out of my room, it was obviously time to adjourn to the pub for the necessary planning meeting. On Monday morning we met up with our fourth course member, Colin Stringer, an Aston Down member returning to flying after a few months off, together with our leader Don Puttock and our winch driver for the week, Dave. 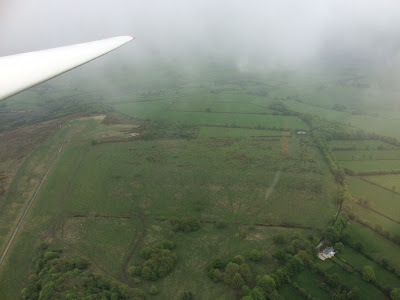 In fact the weather on Monday was pretty poor, we all managed two flights in the K21 Don sending Adrian, Colin and myself off solo after a site familiarisation, but no records were going to be broken today. The meeting of great minds? Tuesday looked altogether better, we had the club's K21, K23 and Astir CS between the four of us. By the end of the day all of us had soloed in the K23 and three of us in the Astir, with Colin, Chris and Adrian each disappearing for long periods of time. As the day wore on Don decided it was time for me to do my Bronze skills test. On the inevitable cable break I duly followed the ASDA rule drummed into all of us at Brentor. As I actioned my decision to land ahead by deploying full air brake the voice behind me announced that the runway ahead had suddenly been declared unuseable and a modified circuit was now required. It must have gone all right as Don told me I'd passed as we put the gliders away. So I had 9 flights the others somewhat fewer but for all of us time in the air was good. Thursday's excitement was Chris going solo in our Cirrus and Adrian and myself going off in a motor glider to do the navigation, field selection and field landing elements of our cross country endorsement. For those who have yet to do that I highly recommend it. Both of us had a very enjoyable couple of hours and a big thank you to Lee Ingram who also signed us both off. Adrian then topped off his day by achieving his silver height, with his logger switched on! Congratulations. Another View of the Std Cirrus. 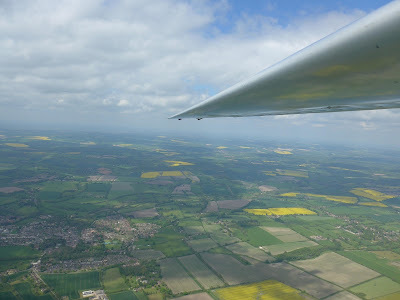 Sadly I had to leave on Friday but Chris and Adrian had another excellent day, with Chris consolidating his Cirrus experience with another four or five flights. The chance was also taken to rig and fly Aston Down's ASW 19, adding another aircraft type for everybody. 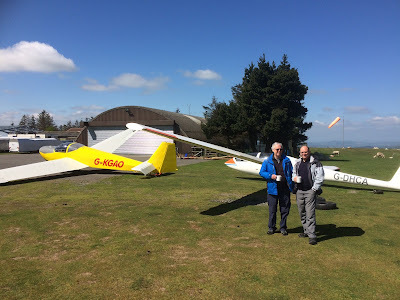 So after the week, I've got my Bronze and just need a two hour flight to finish the cross country endorsement, Chris and I are both signed off on our Cirrus, so expect to see it on the grid at Brentor soon, Adrian has finished his Cross Country endorsement and achieved his Silver height. We each flew five different aircraft types. Of course normal "detachment rules" apply so I can only report much non-flying hilarity. All in all a pretty successful week. A big thank you to Don and Dave without whom none of that would have been possible. 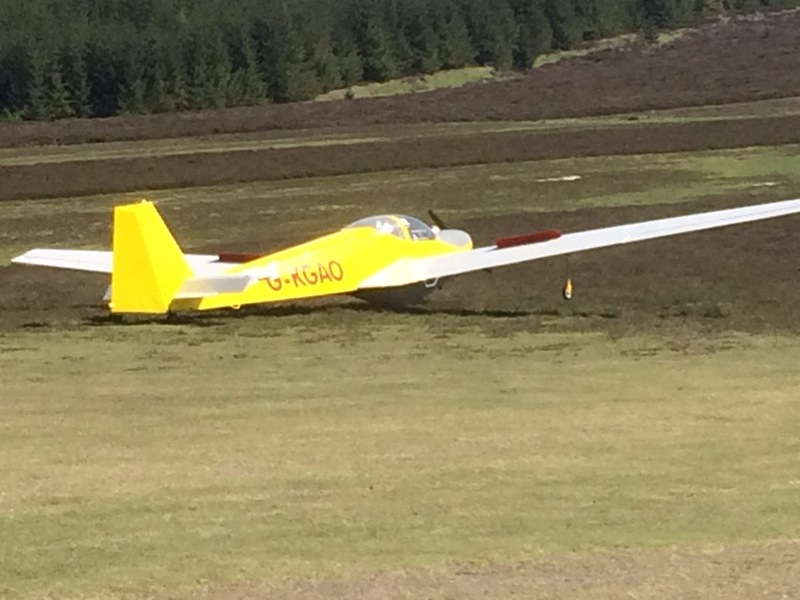 The patches of snow on the top of the Long Mynd didn’t bode particularly well for the start of the week - at Dartmoor we are all acutely aware of the effects of melting snow on an already saturated airfield. It was coming up to 10a.m. on Sunday morning and I had left Taunton at 6.30. 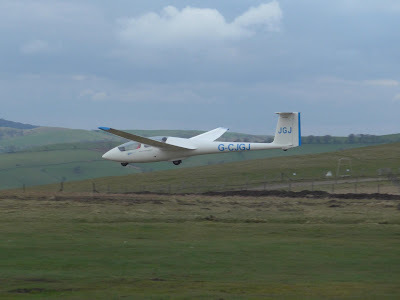 Three and a half hours to the Mynd towing a glider trailer with a rather inadequate Renault Kangoo van wasn’t bad, and would probably give the members towing a glider from the Brentor area a journey of four and a half to five hours, considerably less without a trailer. Mike Gadd was the only other DGS member at the airfield, having travelled up the day before in the hope of making the most of a potentially flyable weekend, The airfield was a hive of activity, with MGC members rigging and dragging out club gliders, intent on making the most of the day after a pretty horrendous Saturday, (2 - 4 ins. of snow had fallen the previous day.) “Wind 5 knots W, sunny and thermic” declared the log sheet. The first launch was at 10.30a.m., the first of 57 that day. Using a single cable and a retrieve winch is a fast and efficient launch method. 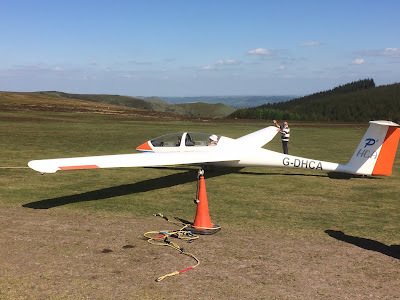 With us both rigged by midday, Mike needed a check flight while the duty instructor was happy with me taking the K6 up straight away, being current and having spent a week at the Mynd last year. 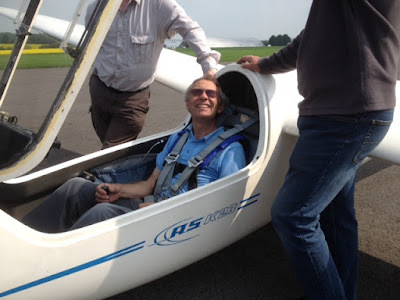 By 1.30 we had both taken to the air - Mike declining the chance to soar with the instructor in the club twin Astir, preferring to get his Cirrus in to action with an early circuit taster of 6 minutes followed by a ‘grand tour’ of the westerly valley and surrounds lasting an impressive 2.5 hours. 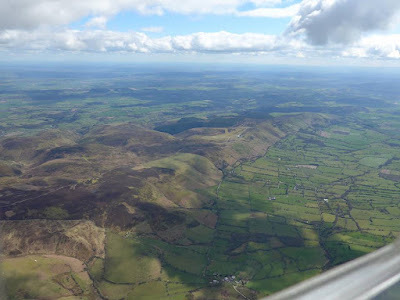 My own K6 seemed to enjoy the Shropshire air, bobbing around in thermal lift, possible convergence, needing air brake on three occasions at 4000ft to avoid disappearing totally in to cloud. By mid-afternoon the northern part of the ridge seemed, from a distance, to have been infested by a large swarm of insects, which on closer inspection turned out to be several thousand (o.k., slight exaggeration!) hang gliders and paragliders, with model aircraft lower and further north - all revelling in the ridge lift that a westerly brings to the Long Mynd. 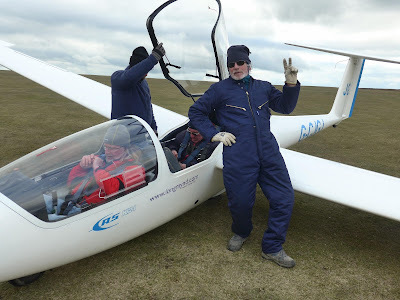 Soaring with other gliders is, with careful lookout, fun; soaring with the Red Kite of the area is Awesome, ridge soaring in a gaggle of hang gliders is, well, interesting. By late afternoon, for any pilot slightly disorientated, the airfield became even easier to locate when a strange kryptonite green glow appeared near the clubhouse. Clearly noticeable from 2,500ft, this turned out to be Colin Boyd’s van, newly arrived with his own K6CR along with Robin Wilson. By the time flying had stopped at 6.30 all the DGS crew, except Martin Cropper, had arrived,and with the MGC catering service having a night off we all adjourned to Wentnor, a tiny village in the western lea of the ridge for a huge pub meal at the Crown, washed down with the local ale. A good start to the week. Monday 18th April, and an introduction to the ‘Short West’. The airfield at the Long Mynd runs north to south and is bounded by public rights of way; any easterly/westerly will mean launching in to a crosswind - not necessarily a problem for a pilot, but a situation which could, without the proper checks and balances, result in a walker, cyclist, bird watcher being injured by a drifting cable. At the morning briefing Dave Crowson, the duty instructor, gave us the possible field layouts, the most probable being the ‘short west’. 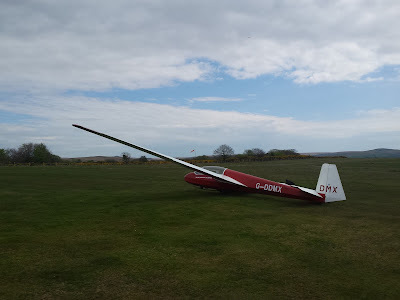 This involved siting the winch near the clubhouse, on the edge of the ridge, across the field and no more than several hundred yards from the gliders on line, giving a launch of a few seconds and a launch height of two to three hundred feet - literally lobbing us off the ridge. 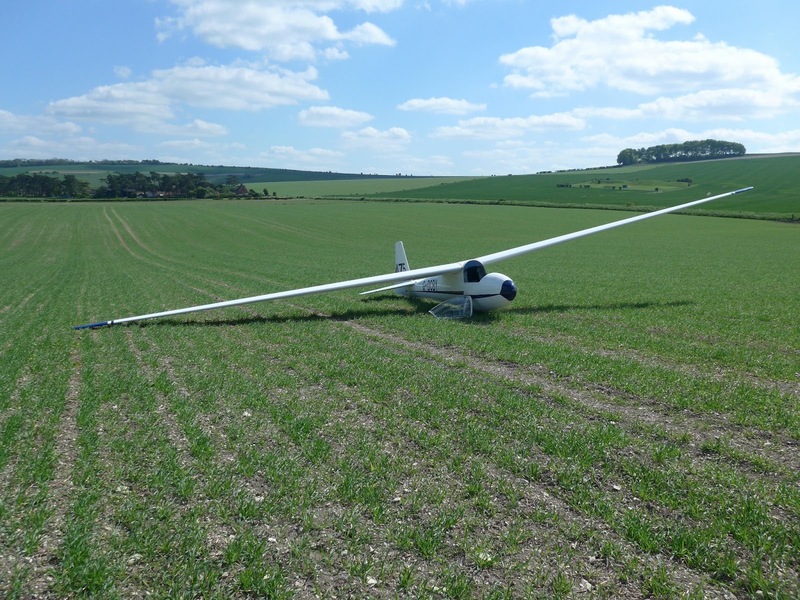 The pilot would then either connect with the ridge lift or, if necessary, land out in one of the two fields below the ridge previously selected as the ‘get out of jail’ option. Sounded interesting! Wind W 25knots and gusting. Short west it was then. Adrian Irwin went first in the ASK 21, duty instructor in the back seat, followed by Simon Collier and Robin Wilson all scrabbling away from launch heights that us ‘Brentorians’ would consider a low level launch failure; all seeming to make light work of a form of soaring we just don’t get at Dartmoor. Mike Gadd went next in his Cirrus, then me in the K6. Meanwhile in the K21 Colin Boyd stretched his check flight to 1 hour 11 minutes, Dave Downton, our ‘Voice of Dartmoor’, got his longest ever flight at 1 hour 2 minutes. 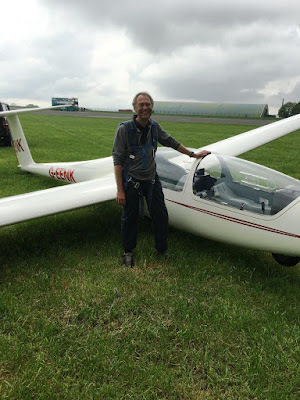 Mike Bennett played around on the ridge for for just under an hour and Martin Cropper, fresh from his impromptu tour of the Midlands, finally arrived at the airfield in time to enjoy a flight of 1 hour 4 minutes. Adrian Irwin, cleared for the K23, also flew for over an hour. Only eleven launches that day, but everyone flew, all flights were over 25 minutes, some considerably more, and we all enjoyed a day of safe and exhilarating ridge soaring. Tuesday 19th April, A day of Promise! Morning briefing - wind NNW, veering to the E later…..maybe, Unfortunately the weather is often no respecter of the forecast. We set up the field to launch to the north, discussed options for launch failures and commenced flying at 11.23a.m. Adrian took the first launch as P2 and was back in three minutes. I took the second and managed five. Adrian again four minutes, me again four minutes. Colin Boyd found a tickle over the airfield in his K6, patiently worked it, got 2000ft and headed southwest towards Bishops Castle in pursuit of a tasty looking black bottomed Cumulus. All he caught was 10 down and had just enough height to get back. And so it went on for the rest of the morning until at 1 o’clock, when, having just launched Robin Wilson for his second flight with Martin, the winch driver called a lunch break. Colin actually got the longest flight of the morning session with a very creditable nineteen minutes; where there is lift there is hope! Launching resumed at 14.09, and then suddenly pilots started to find lift; forty two minutes, fifty two minutes, two hours six, two hours three, two hours forty one, one hour thirty one, the log book told its own story. And then back to single figures…. For some an exhilarating and rewarding day, for others deep frustration and too much time on the ground. Time to adjourn to the bar and reflect on the day. There was always tomorrow…… or so we thought! 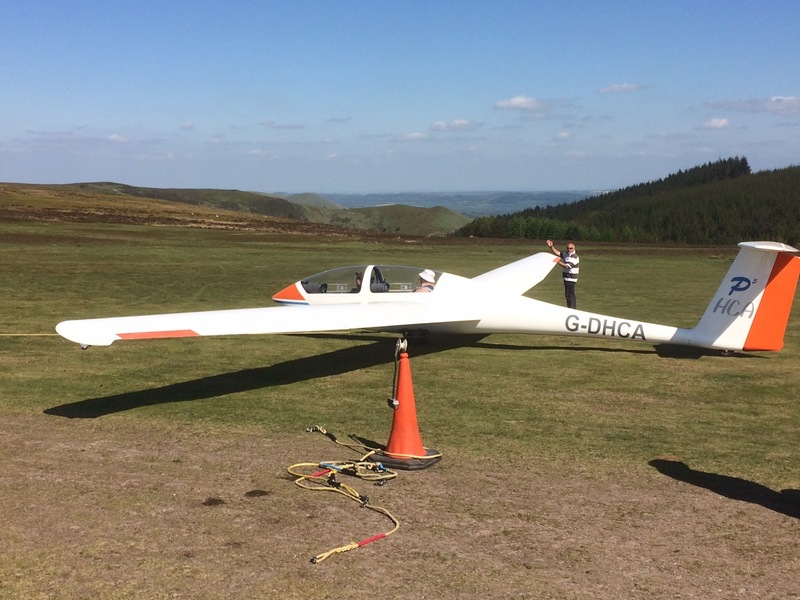 An easterly wind at Dartmoor, especially one due east gusting 20-25 knots, would have DGS members rushing to set up the field and rig, but not so on the Long Mynd. A launch to the east would be short, downhill, across the runway, and with no options in the event of a launch failure; so if you live in Shropshire it’s a good excuse for a lie-in. With the forecast for the wind to strengthen into the afternoon and following day, and rain expected on Friday,but with the surplus of optimism that all glider pilots must have to stay sane, we delayed a final decision on the day until late morning. Eventually, though, we had to acknowledge the obvious - flying for the week was over. Good excuse for a club outing. RAF Gosford was just thirty minutes away, with free entry into one of the best aircraft museums in the country this was an opportunity not to be missed. We would all rather have been flying, but this was a decent second best. The weather at Gosford was positively balmy but returning to the Mynd it was still blowing an ominous easterly gale, so we had, after all, made the best of the day. 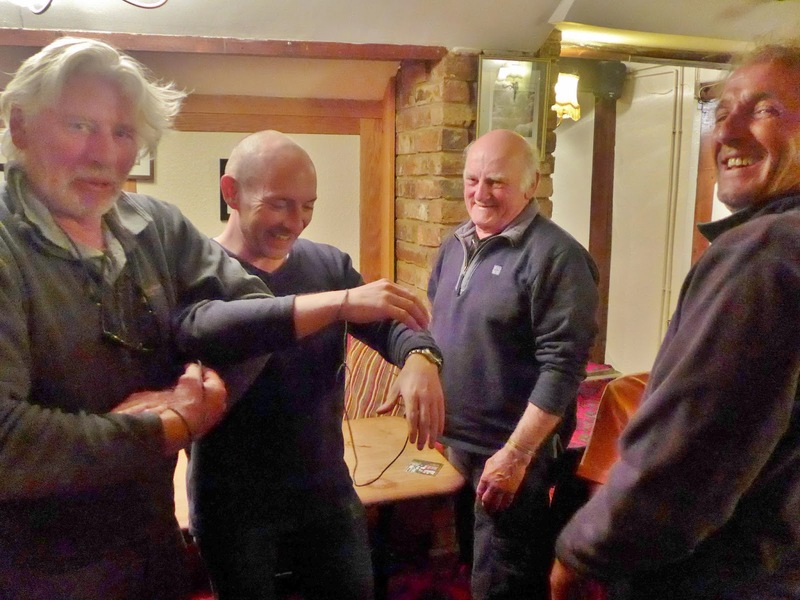 There was a final evening at the Crown, Wentnor, where the Mike Bennett’s Challenge had Simon Collier and Colin Boyd tied together and engaging in what looked like a strange mating ritual to get free - much to the amusement of the local clientele (never go drinking with they Dartmoor lads!) and the expedition was over. The next morning we went our separate ways; not as much flying as we would have wished, but then there never is. A lot of good memories, precious memories, and the promise of next year.